India’s prime minister seized control of a national anti-corruption debate Thursday, calling on Parliament to discuss protesters’ reform proposals and appealing to a weakening 74-year-old activist to end his nine-day hunger strike. Prime Minister Manmohan Singh’s address to lawmakers was his most direct attempt at ending the stalemate between the government and Anna Hazare over competing plans to root out the corruption infesting the country. Mr. Hazare said he was unsatisfied, but also slightly softened his demand that Parliament swiftly pass his sweeping proposal to create a powerful government ombudsman. Mr. Hazare told an estimated 40,000 supporters at his protest camp in the capital that Parliament should begin discussing on Friday his demand that it include low-level bureaucrats and state officials under the ombudsman’s oversight and establish rules for greater transparency. If both the opposition and the government agree to adopt those demands into law, “I will end my fast,” he said. However, he vowed to remain at the protest camp even after that to ensure that all his other demands are met. The government, which has introduced its own watchdog bill, has dismissed elements of Mr. Hazare’s more stringent and sweeping proposal as unworkable and unconstitutional. Mr. Singh told Parliament that it should hold a full debate on all versions of the bill — including at least two others proposed by civic groups. “All ideas should be discussed and debated so we will have the bill which is the best possible bill that will help us deal with government corruption,” he said to rare applause in a Parliament that has broken down repeatedly in chaotic protest in recent weeks. Saying Mr. Hazare’s message had been heard, the usually staid Mr. Singh made an emotional appeal to him to call off his hunger strike. “He has made his point. It has been registered with us. I respect his idealism. I respect him as an individual. He has become the embodiment of our people’s disgust and concern about tackling corruption. I applaud you, I salute you, and his life is much too precious. And therefore I would urge Sri Anna Hazare to end his fast,” Mr. Singh said. In an unusual show of unity, the opposition endorsed Mr. Singh’s appeal. “This house appeals to Anna Hazare that his life is precious, so please end your fast,” said Sushma Swaraj, leader of the opposition in the lower house of Parliament. Mr. Hazare’s fast has struck a chord with Indians horrified at endemic corruption and the seemingly never-ending scandals said to have cost the treasury billions of dollars. On Wednesday, police charged four lawmakers for their alleged role in buying and selling votes in Parliament. The protest has left Singh’s government flailing for more than a week, as Mr. Hazare’s aides harnessed Twitter, Facebook and the nation’s breathless, 24-hour news channels to rally support for their cause. But the government appeared to gain momentum in recent days, as other activists, including novelist Arundhati Roy, began to criticize Mr. Hazare’s protest as misguided and antidemocratic. On Wednesday, the government held a meeting of all parliamentary parties, which agreed only to give the protesters’ draft “due consideration,” not the guaranteed passage that Mr. Hazare had sought. Both sides dug in their heels and talks broke down Wednesday night. Mr. Singh’s address in Parliament sent a signal that despite their strong differences, the lawmakers were united in their belief that the legislature not be dictated to by the protesters. “Parliament must have a chance to give its views on their bill,” he said. And Mr. Singh — who has been heavily criticized for presiding over a scandal-wracked Cabinet — spoke with unusual emotion, saying he was sickened by attacks on his personal integrity. “When wild charges are levied against me, it hurts,” he said. He admitted he may have made mistakes in his seven years as prime minister but insisted he maintained his personal integrity. “To err is human, but to accuse me of evil intentions, of conniving with corruption is a charge I firmly refute,” he said. Meanwhile, businesses and wholesale markets shut down across the capital as the Delhi Traders Association called a strike in support of Mr. Hazare’s fast, and scores of protesters demonstrated outside the prime minister’s official residence. 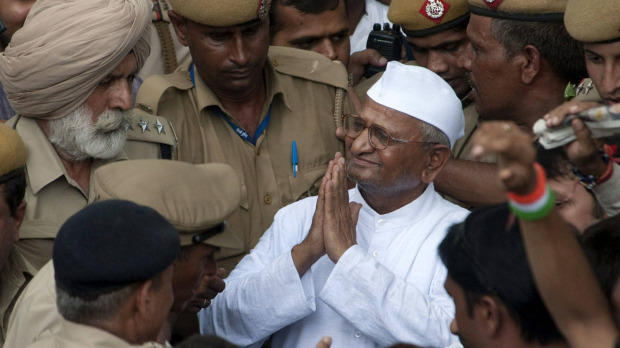 Protest organizers had been raising concerns that authorities might detain Mr. Hazare and force feed him. Mr. Hazare asked his supporters to block the exits if police tried to take him away.